The first thing anyone wishing to shuck oysters should do, is obtain the best oyster knife that they can afford. This is a purchase that ensures that not only will you have the right tool for the job, but also will be helping to make the process of shucking a little less dangerous. 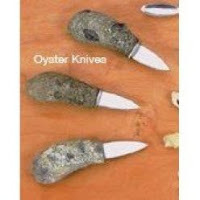 The reason you need a real oyster knife is that it is designed for the specific task of prying oysters open. Other knives aren't up to the task. You'll need this important addition to your kitchen culinary supplies.Some oyster knives vary in the shape of the blade. Usually, the blade is somewhat triangular shaped, short, and blunt. While moderately priced as a set of three, these oyster knives were not meant for serious shucking of oysters, because the handles are not comfortable. The knife blade is also too flimsy. 2. OXO Good Grips Oyster Knife , a set of two currently retails for around $20.00. for shucking at 7 inches. Supposedly, the handle absorbs pressure while you shuck but I found no discernable difference in it and other oyster knives. It is dishwasher safe. However, it has been my experience, that this particular inexpensive oyster knife will break, when you least expect it. 3. I had better luck with a Chroma USA Oyster/Paring Knife, that while a little pricey was a very comfortable short, thick bladed oyster knife. This professional Japanese steel bladed knife retails between $40-$50. This is a very well made knife. 4. One of my favorite knives for shucking oysters is the Wusthof Oyster knife . It is truly a quality stainless steel bladed knife of a very comfortable size that retails between $45-65.00. 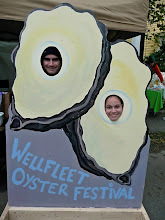 Sorry I don't have a picture of it, as it was borrowed from another oyster-shucking aficionado. 5. 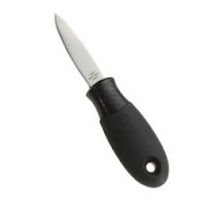 A more modestly priced better oyster-shucking knife is the Victorinox Oyster knife. This oyster knife is a high quality carbon stainless steeled blade and larger handled than others. It retails for a moderately priced $25-$30. - Victorinox Oyster knife . The selection of a good oyster shucking knife boils down to personal preference and common sense. Oyster shucking can be slightly dangerous, so keep in mind that a good forged knife is always better than a stamped knife. A good quality knife, while more expensive, is simply a better knife. article written by Jerilee Beitzel, used with permission. The type of knife that you choose should fit into your kitchenware easily and be simple and comfortable for you to use. Some people prefer the comfort of a rubber handle while others like the firmness of a wooden handled oyster knife better.